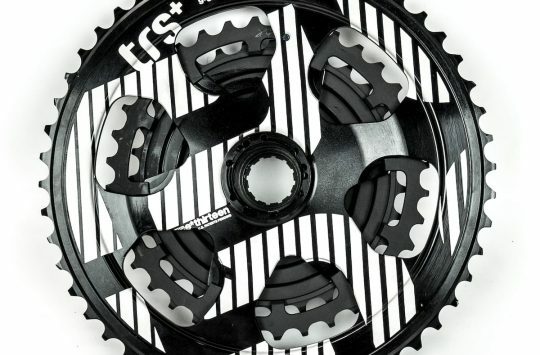 The TRS comes in two versions: Plus and Race. 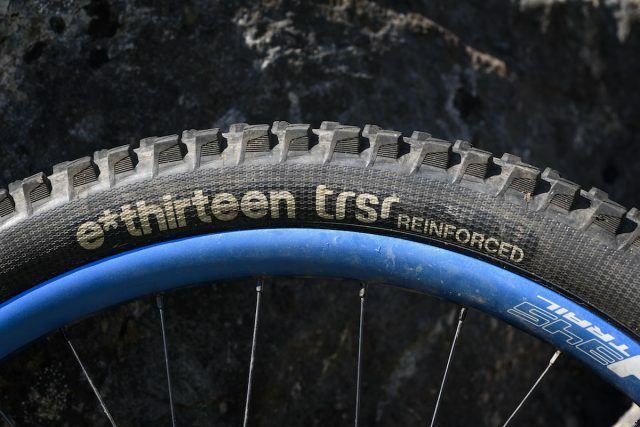 Joining e*thirteen’s ever-expanding product line-up last year, the e*thirteen TRSr is intended to slot in between lightweight cross-country tyres and super-burly downhill tyres – in the words of Goldilocks, not too hot and not too cold, but juuuust right. Or to put it another way, a regular trail tyre for everyday use. That might be doing these tyres a slight disservice though, as they’ve performed brilliantly throughout the test and are more than ‘just right’. 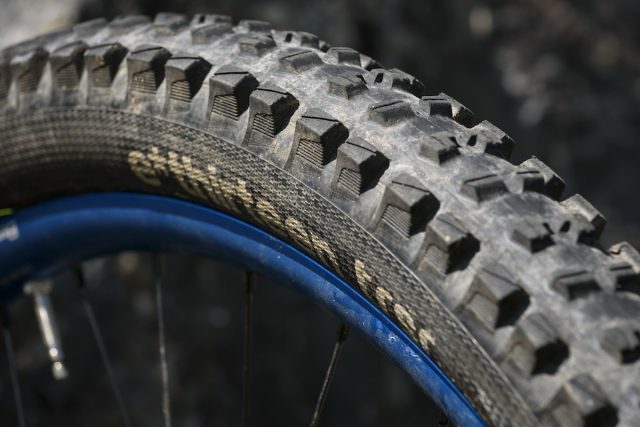 Available in 27.5in and 29in options, with folding bead, reinforced sidewalls, reinforced pinch flat zones and enduro casing, they tip the scales at 918g (27.5in, 900g quoted) and are designed to pop up tubeless with just a track pump and a scoop of sealant. True to their word they went up without needing a compressor on every rim we tried, every time. Available in two compounds (Race or Plus), we’ve been riding the softer, grippier, Race compound which is made up of 70a rubber at the base, 42a in the centre, and a 40a for the side knobs. Loads of siping and blocky edges deliver all the traction. And reinforced casings support the tyre when being run tubeless at lower pressures. Given how soft the tyres feel under the thumbnail, they rolled along really well, and were only a bit draggy on long road sections. Once up to speed and onto the fun stuff though, that drag wasn’t noticeable, and the payoff was that they provided ample grip for climbing, especially when faced with things like slanted wet rock or rooty madness sections. 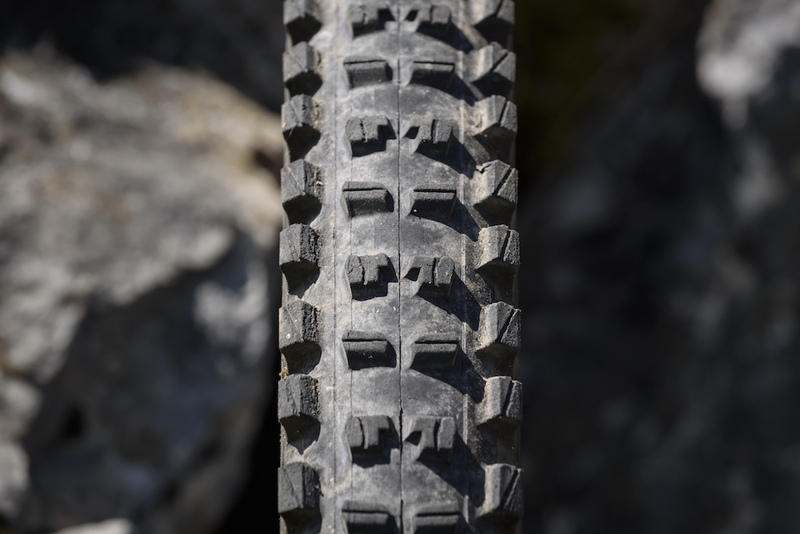 If outright climbing traction isn’t required, you might want to consider either the harder compound TRS+, or a modern semi-slick such as the Maxxis Minion SS. 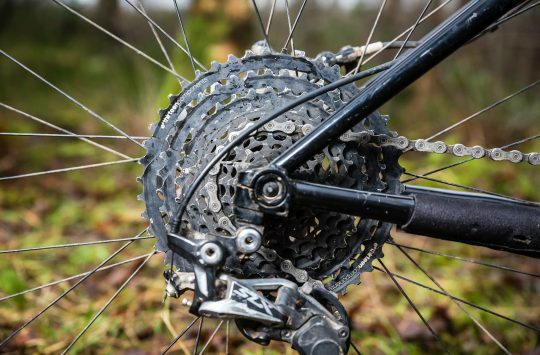 The sidewalls felt really supportive and I often found myself running less pressure than I thought – sometimes as low as 22/24 psi front/rear, with very little tyre body roll, while on rockier Lakeland descents we upped the pressures slightly. Even if you go fast enough to drift, the traction is super-reliable except on very loose marbley surfaces, where we have yet to find a tyre that works perfectly. 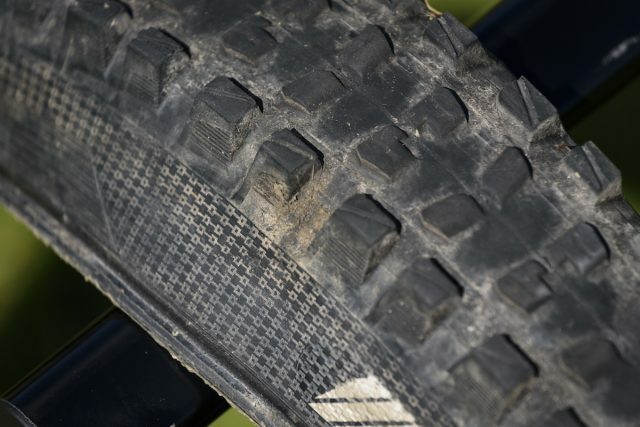 With a carefully shaped and siped tread pattern reminiscent of a Magic Mary, they offer great grip in mud and slop too, with lots of clearance, and the rubber was soft and edgy enough to keep things under control for braking when the going got loose. We did suffer a couple of punctures throughout testing, including this one we plugged up with a rubber worm. On the first off-road descent of the first ride on the tyre, we managed to put a hole in the rear that needed two tubeless plugs to seal. However, after that, it has been puncture and trouble free for over a year, even hitting long rocky Lakeland descents where we could feel the tyres bottoming out and carbon rims impacting on the ground below. They’ve not been ridden every day as they’ve been on a ‘weekends and trips’ bike, but we reckon they’ve done a good few hundred miles. While the rear is worn, they are looking surprisingly good for their age, and for the amount of riding time we’ve put into them in relation to the level of grip they return, the wear has been excellent and as they’ve worn the performance hasn’t fallen away as dramatically as it has with other tyres on test. Consider these as high performance sports car tyres – they ain’t cheap. There is no denying that at £71.95, these are at the very upper end of the price spectrum. 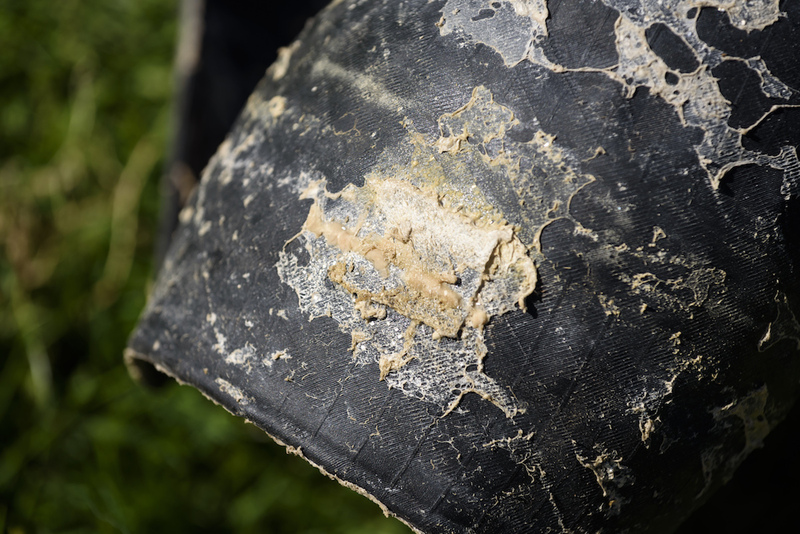 If you’re a high-mileage rider that shreds through tyres, then it’ll be worth considering the TRS Plus tyre, which uses the same construction and tread pattern but with a cheaper dual compound rubber blend for £59.95 per tyre. That said, we’ve really got on well with these tyres, If you think of them as track day tyres for your sports car, it’s well worth getting a pair for racing and Alps trips and maybe use something else for day-to-day riding. 72 quid for a push bike tyre ? Better than the Magic Marry? 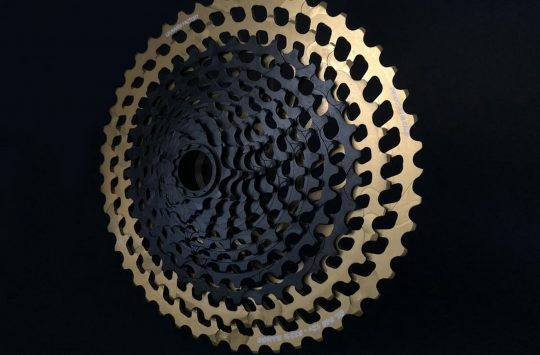 @lagerblad – we didn’t directly compare the E13 TRSR to the Magic Mary in this test, as Schwalbe sent us a pair of Hans Dampfs and it’s been a while since I rode a Magic Mary in anger. From memory though, I think the Magic Mary might offer a touch more outright grip (particularly in super steep slop) while the E13 is lighter and wears slightly better. The e13 is not lighter than the Magic Mary. The Trs+ is indeed lighter, but not the Trs Race that was tested here. 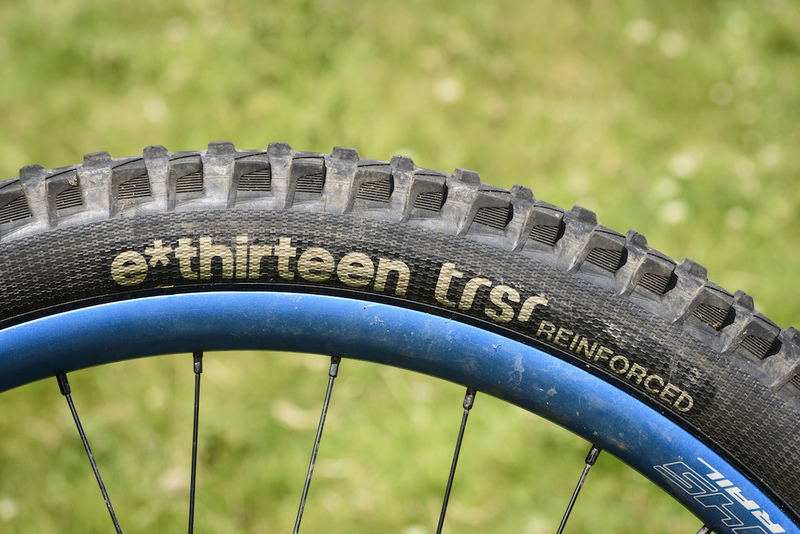 I have all these tires in 29″ and have weighed them as: Magic Mary 1100 g, Tsr+ 1006 g, Trs Race 1142 g. So the weight factor is another reason to use the Trs+ instead of the Race, more than the price in my opinion. But what I would like to see would be a lighter version of the Race and a reinforced version of the Plus. E*13 have done things the wrong way in my opinion, since most people want a faster and stronger tire at the rear and a grippier, lighter one at the front. Speed+strength and grip+light weight and not the other way around.